5 things I'm currently digging . . .
1. That Sarah 101 will air on HGTV in the US starting July 9th! 2. These J. Crew flats. 3. This song by Grace Potter & The Nocturnals. 5. 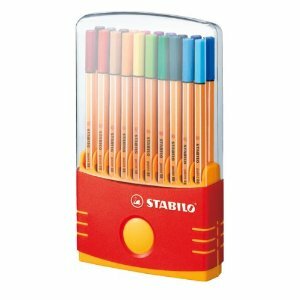 These Stabilo 88 pens. They are life-changing. And I am going to have to check out those pens - never heard of them before! Ohlalala, I love that shirt from Nordie. I've never heard of those pens before. Hmmm, off to check them out. I have been tweeting about Paris -Ooh La La for MONTHS. I am obsessed with that song. LOVE it! You have great taste! Me likey! Will have to check out those pens as well. OH MY! Those shoes are darling and I just love pens like that! I'm so excited about Sarah 101 & I've been in love with those pens for years! That. song. ROCKS. I hadn't ever heard it and it is so kickin' a** and taking names!! I love it. I'm sitting here with my 2 year-old jammin' out to it...and getting *SO* excited for Sarah...she is the design QUEEN. You totally just made my day! I was feeling all sad that Sarah's Summer House ended. I must know more about these pens. I am intrigued! I'm going to have to set my DVR! Oh, I love all of these. That shirt is calling my name. And so excited about Sara 101. That couple that got married is so beautiful! You can finally watch Sarah 101! I am interested to know what you think of it, after all this hype! Oh I love that shirt and those pens are so fun! Sarah 101 - YAY! I love that shirt, wow! I love J.Crew flats!!! Im glad I found your lovely blog!!! House & Home Eye Candy. Update: Cocoa & Hearts Painting.